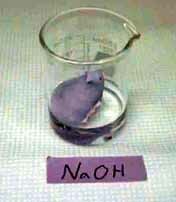 Properties of Sodium Hydroxide: Fused solid with crystalline fracture. Rapidly absorbs carbon dioxide and water from the air. Very corrosive (caustic) to animal and vegetable tissue and to aluminum metal in the presence of moisture. Uses: NaOH solutions are used to neutralize acids and make sodium salts; in reclaiming rubber to dissolve out fabric; in making plastics to dissolve casein. Human Toxicity: Corrosive to all tissues. How many ways can we say that nothing happened? Of course, we really didn't expect anything to happen here. There was no good scientific basis for believing that strong base would dissolve a Peep. However, in this age of political correctness and equal opportunity, we didn't want to appear biased using a strong acid, and not a strong base.